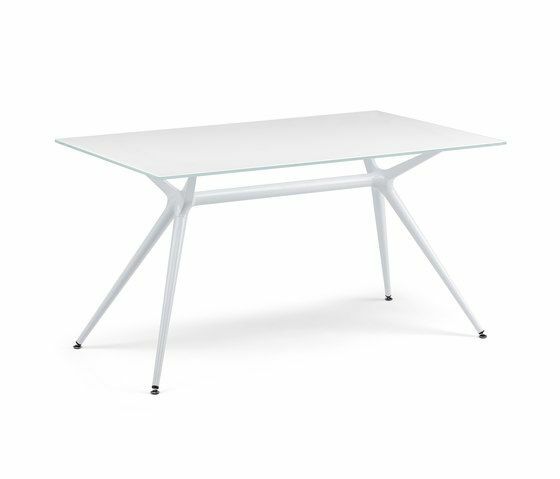 Table with rectangular top 210x100 cm. in stratified compact. Legs and cross-beam in opaque painted steel. Support element for the top in opaque painted die-cast aluminium. Finishes of painted structure: opaque white, opaque graphite, opaque dove-grey. Colours of top: white, dove-grey oak, beaver oak, cement effect. For indoor use. The SCAB Design tables SCAB Design presents to the public a rich collection of tables, ideal for the home, contract and outdoor. The models proposed are available in different versions to adapt with style to the home or public venues: perfect in all those spaces where elegance and refinement do not accept compromises. The range of tables is completed with a unique texture palettes designed to amaze and to create revolutionary combinations with new finishes: in compact laminate dove-grey oak, compact laminate beaver oak and a new version from the particular cement effect. More colors, more shapes are added: In addition to the round and square format, a new and elegant rectangular plan, all available in different sizes.